In this fun video edition of Guitar Tales we are going to let the Angel do most of the talking—in the hands of Jason Kui. Audio, video and still photos all shot in the Anderson Guitarworks Studio. Fun fact is that it was actually guitar player extraordinaire, Sean Ashe, who recorded and shot the video while we crawled along the floor throughout the performance, like stealthy special forces operatives, shooting the stills. 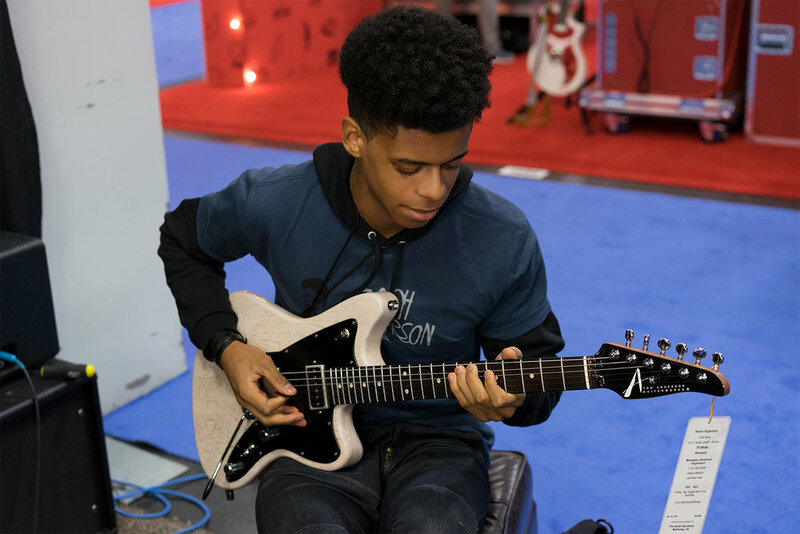 Jason simply plugged his Angel straight into the the face of a Mesa/Boogie JP 2-C and launched into his original composition, Morning Breeze. For full specs of Jason’s Angel, check out Guitar Tales. A really nice video review from Jim Lill, featuring his favorite Hollow T Classic. Check out more great videos from Jim on his YouTube Channel! "Top 5 Guitars By Tom Anderson" - another great video from the great Tim Pierce! Enjoy, and be sure to check out more from Tim on his Youtube channel and his website! Speaking of good friends, here's Teddy - making a funny face of guitar delight. He owns Make'n Music in Chicago, IL. He ordered both the Cobra S (left) in the very popular Satin Atlantic Storm, as well as the Drop Top (right) in Cajun Red Reverse Surf. Many consider Cobra S to be the most formidable Anderson to exist in "S" form. It's Mahogany superstructure and shorter 24 3/4 scale length give it impressive and unparalleled midrange prowess. This one (left) in Satin Atlantic Storm, easily focuses its powerband and demonstrates its versatility through our PH1 pickup at the neck and full voice HC2 humbucker in the bridge position. 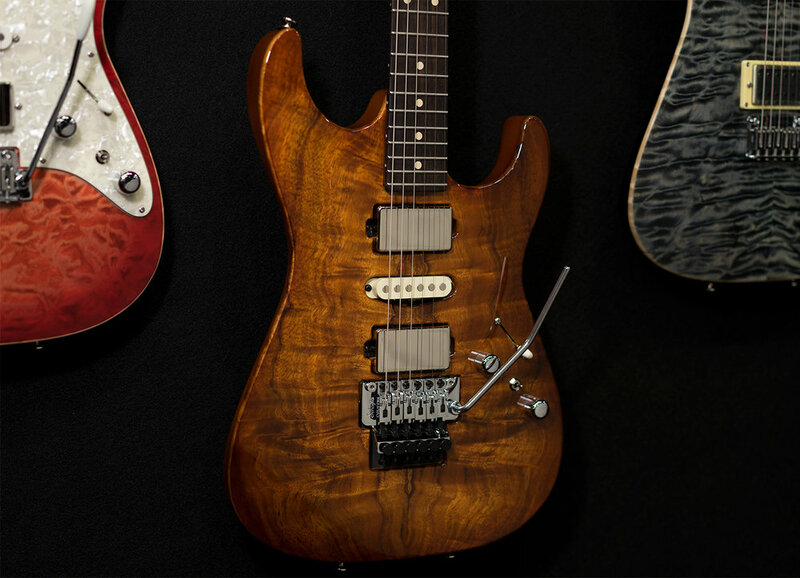 The Drop Top (right) is loaded with SC1 neck and middle pickups, and a hot H3 in the bridge. SCs sing with a lush and vibrant, hum-free, vintage vibe that makes easy and sweet work of your single coil duties. 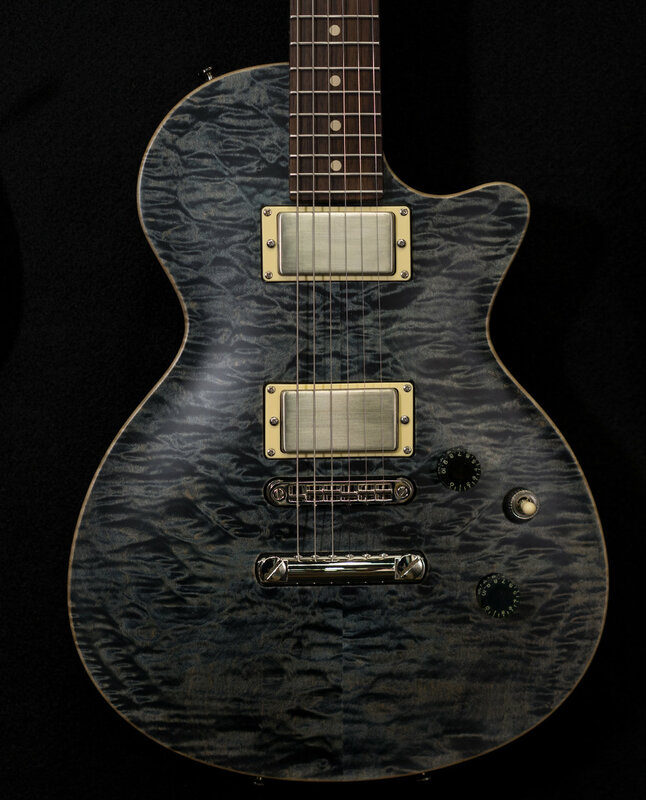 H3, our original super screamin' humbucker, sings as a super-powered humbucker but still possesses tremendous amounts of gorgeous soul. And because we know you wanted a closer look - Cajun Red Reverse Surf. Nice choice Teddy! That's it for now, but keep checking back in What's New and Guitar Tales. We'll have more from the show to show you later! Here's something on the classic side of things: a Hollow T Classic, in Tobacco Burst. 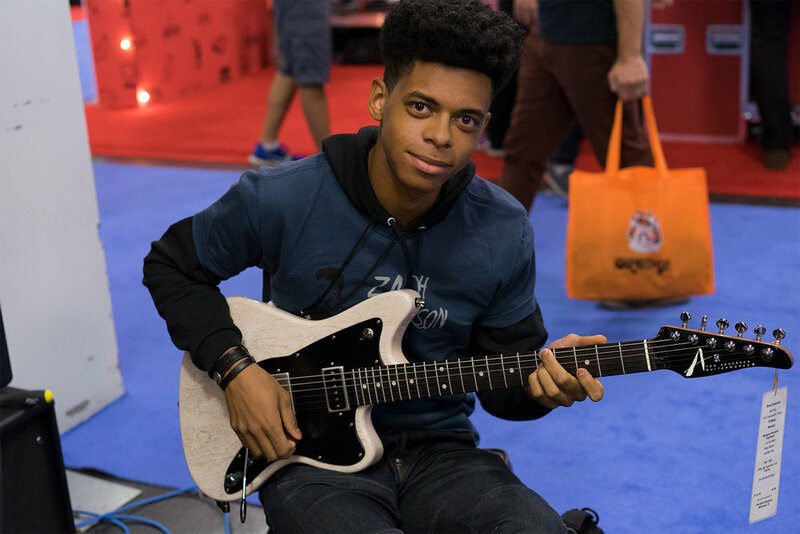 With an Ash body and Ash top, a short-scale Caramel Maple neck along with HF1- and TF3 pickups, it can cover a wide range, and has had quite a few people rethinking what a T guitar can do. One of those was Will McFarlane (left), who came back for another round of Anderson Guitarworks exploration - we're always glad to see him, and especially to hear his incredible playing. While he was in the booth, he ran into Michael Lent (right), another session and touring guitarist extraordinaire who's plays for Barry Manilow and so many others. Michael was enjoying this gorgeous Drop Top with a Koa top, Rosewood neck, HSH pickup combo and a Floyd Rose locking trem. Lastly for today, here's a fiery Drop Top Classic in Natural Red Burst. 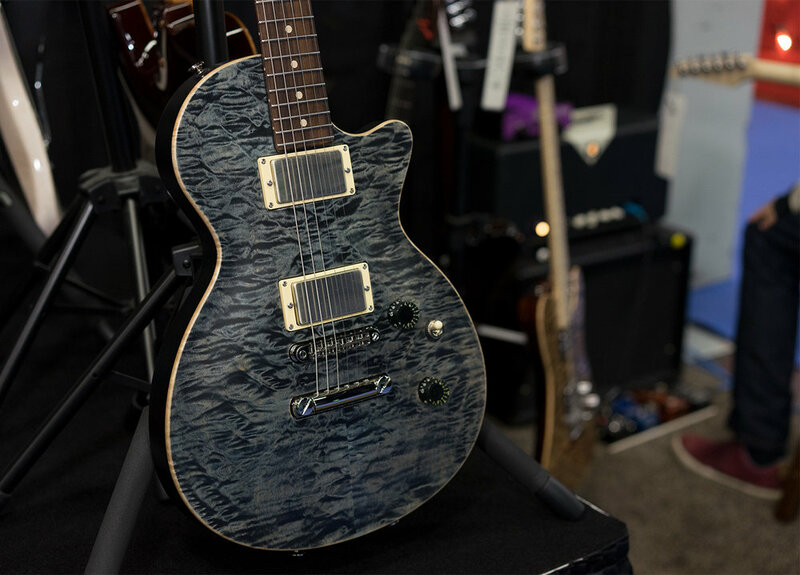 With a maple neck, SC1 and HC3 pickups, it's ready for anything. Here's the official debut of Bobcat (in Satin Atlantic Storm, and Satin Deep Tobacco Fade) and a Drop Top refined with Koa Top and finished in Honey Shaded Edge. Need something heavy for your Halloween playlist? Well, here's Anderson Artist Jason Frankhouser with some screaming lead riffage and downright crushing rhythm tones. Courtesy of his Anderson Guitarworks Seven, and a Fortin Evil Pumpkin amplifier. Scary good! A couple of our favorite vintage-inspired Anderson Pickupworks pickup models are currently featured in the October 2016 issue of one of our favorite magazines, Vintage Guitar. 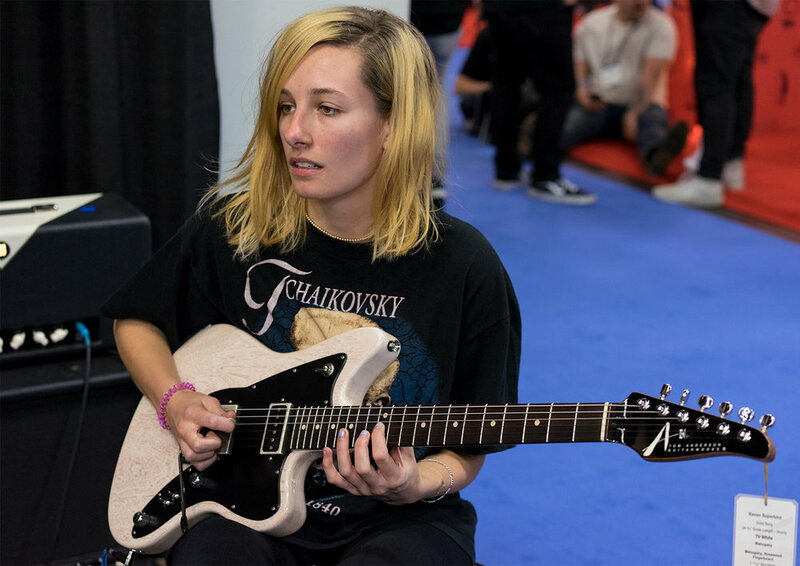 "So You Say You Want a Revolution: The VG Guide to Single Coil Pickups" explores 42 of "the most modern examples" of the single coil pickup. 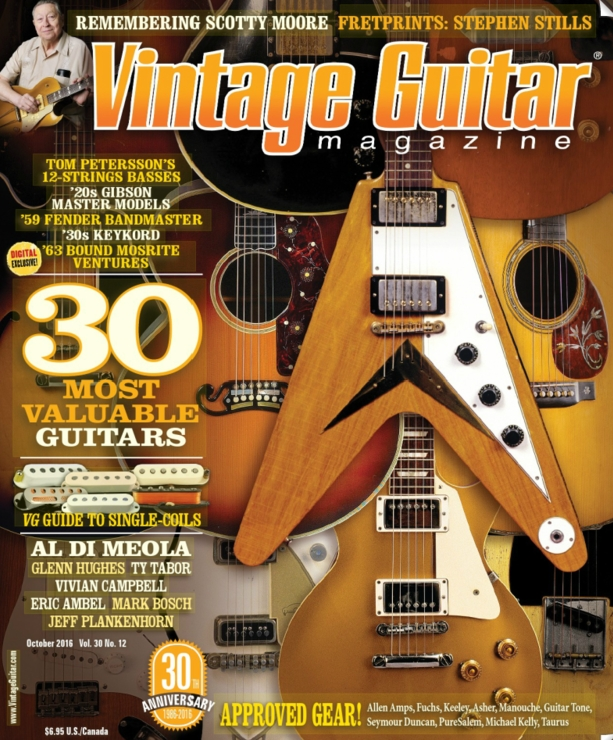 Check out Vintage Guitar in print or online for the full feature. 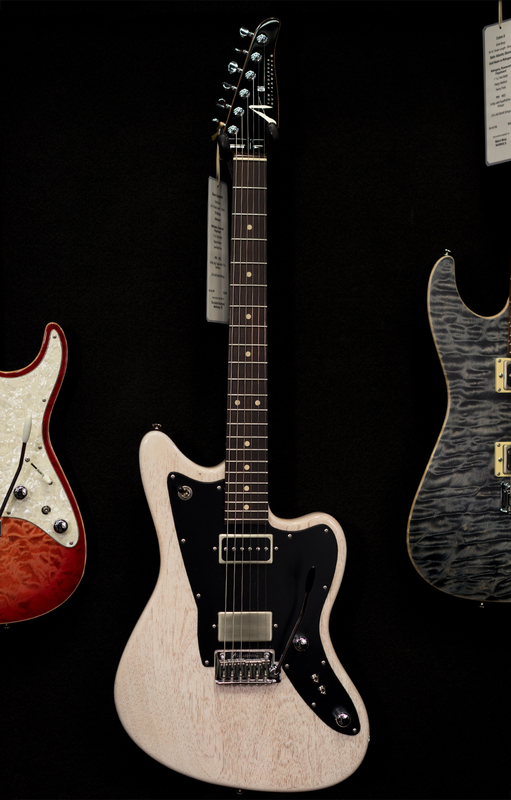 And, if you're ready to experience the best pickups in the world, check out our Pickups Shop!